“I’m so glad to hear it! Your parents have worked so hard, they truly deserve it!” This is the common reaction of our long-term happy customers when they ask us “where are your mom and dad?” only to discover that our parents, Thelma & Salvador, are once again off on another sponsored vacation. These are the same customers that aren’t surprised when they pull into our shop and see dad’s brand new Lincoln Navigator parked outside, and will “ooh and ahh” in genuine heartfelt admiration of him. They are the caring customers who’ll stop by just to drop off some cookies for mom. Kind, loyal patrons who’ve turned into family friends and care greatly about the two amazing people behind T & S Auto Repair on 2261 West 43rd St. They know about the many hardships encountered by our family in the past and the incredible tenacity that led us to the success we’re enjoying in the present. Hi! My name is Jessica. I am the eldest of Thelma and Salvador’s three children and a market research analyst and marketing specialist. My sister, Marci, is a professional graphic designer who’s creative, detail-oriented, problem-solving talents have been best used at the shop for troubleshooting vehicle problems. Marci is usually the first person you’ll see when walking through the door and she’s always willing to, in the most gracious and straightforward manner possible, answer your burning questions and appease your most worrisome concerns. Our youngest brother, Augusto, discovered early on a passion for cars. He spent his early years, as did the three of us, holding signs promoting our family’s auto repair shop, running away from dogs while we went door to door handing out flyers, doing oil changes, rotating tires, washing customers’ vehicles, and cleaning up. Then came the day he threw down his broom, exclaimed that he was done being the shop hand, and expressed a desire to start working on vehicles. Now a State Inspector and an A.S.E. Certified Master Automotive Technician, Augusto will bunker down in his bays and sweat bullets until he discovers what’s ailing your vehicle and gets your car running smoothly again. The area we call our neighborhood, Oak Forest, has changed drastically in the past couple of years. Where once stood one-story houses; homes to elderly couples whose children had gone off to college or grown up… you’ll now find million dollar homes belonging to young professionals who are just starting families of their own. Customers used to know us all by name. They trusted us because we had kept their vehicles, or their neighbors’ vehicles in great shape over the course of years (if not a decade! ), sometimes bringing in their vehicle for inspection just to have a friendly conversation with mom. Cut to the present, our long-time customers are now outnumbered by a new generation of vehicle owners who’ve just recently discovered our business online. Customers arrive at our shop because they’ve read another client’s recent review, but they don't know much about our family or the 23 years we’ve been in the Auto Repair Business. We embrace these demographic changes and digital trends and are currently in the process of integrating new technology in the way we do business. Having recently invested in a new platform, we hope to better and more efficiently keep track of your vehicle’s history and upcoming maintenance requirements. The system will allow us to better serve your needs when you bring your car to us for a check-up or remind you when you have important vehicle maintenance overdue. However, before continuing on this new leg of our journey, we decided to take the time to reach out to our new or potential customers and say “hi! It’s great to meet you!” We’d also like to share with you a small fragment of the story behind your “new”, friendly, one-stop, local neighborhood business called T & S Auto Repair. T & S opened its doors in the summer of 1995, thanks to a combination of several credit cards, strong faith, and iron-willed determination. Our family came to this country as most immigrants do, looking for the golden gate of opportunity and a more prosperous life. Mom worked in three different households as a housekeeper, arduously taking care of other people’s homes and children. Our father spent years working long painstaking hours as a service attendant at a well-known gas station for minimum wage and little recognition. That was until they both decided they had had enough of investing their time for someone else's profit and benefit and were willing and ready to take a leap of faith for themselves. The early years of T & S Auto were predominately oil changes, tire rotation, and balance, but my father always instilled the importance of ensuring our customers’ satisfaction. We went above and beyond for each and every person who was brought to our small shop thanks to the flyers we spent Sundays handing out all over the neighborhood, the hand-written signs we held for hours standing under the blazing sun on the West 43rd median, or because of the giant printed signs hung on all sides of an old Chevy Van my father would park wherever he could for as long as he was able to. Summer and winter school breaks for us were spent washing and vacuuming all vehicles that came in, regardless of the size of the sale. My sister and I would compete to see who could turn over an oil change faster, and all of us had to get the bays clean after each and every work day was done. We would wake at the crack of dawn, be dragged to the shop half asleep in the back of my dad’s Chevy Van. 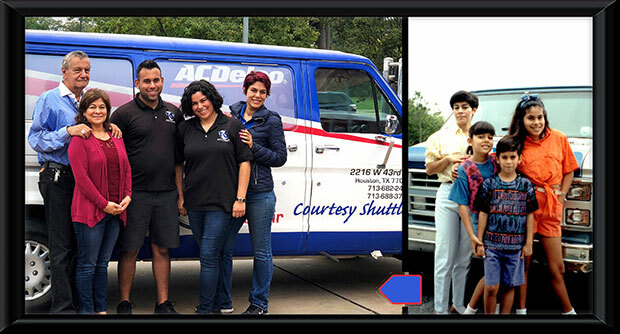 From Monday through Saturday, 7 am to 6 pm, each member of our family would do their part, be it working on or washing vehicles, tending to customers, picking them up and driving them home whenever necessary, and picking up parts all over the Houston area. We would eat the breakfast, lunch, and dinner that my mother made for us from scratch every day, the five of us jammed into the tiny office at our first location on 43rd and Glebe. The cramped space didn't matter, we were just happy to get some welcomed time in the A/C. It was truly a team effort to get to where we are today, and success didn’t come overnight. The sacrifices, long hours, worries, debt, sweat, and tears were real for years. Patience, faith, consistency, honest hard work, and kindness reward those who desire success more than they fear failure. We have come full circle. The gas station my father used to work at closed its doors eight years ago and, through a twist of fate, is now the new location of our Family´s Auto Repair Shop! Our family is blessed and happy to continue providing jobs and driving economic growth in a community that opened its doors to us so many years ago. At a time when opportunities and borders seem to be closing for other families like ours… we truly are grateful to all of the customers who decided to support our small family run shop, to entrust us with their vehicles, and reward our good faith and whole-hearted effort with years of loyalty and recommendations. We wouldn’t be here without your patronage. That is our story in a nutshell… there’s much more to it, but you’ll have to ask us about that when you come on down to cash-in our welcome gift to you for taking the time to allow us to introduce ourselves. We’re happy when we meet a friendly face, and always strive to exceed expectations and gain a new loyal customer. Hope to see you soon! *By Appointment Only... Call to Claim Gift and Schedule!